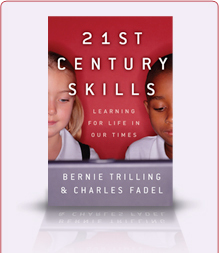 “The 21st Century Skills Movement seeks to reform education to better prepare students for success in the modern workplace. Those skills include creativity, innovation, critical thinking, communication and collaboration. We’ll talk to some Silicon Valley veterans who are working to help students attain these skills. And we’ll find out why the movement has encountered opposition from some education leaders, who favor an emphasis on core content and knowledge. The book review is part of the Book Talk segment http://edtechclassroom.com/?p=527; the relevant audio clip has been extracted here. The reviewer Joe Wood, who frequently presents to schools on 21st century skills, liked the book and put it to work immediately in his next presentation, doing the 4 Question exercise. Many other nice things were said in this review. KUCR, an education radio station in Southern California, featured Bernie on October 27 on “Education Today”. Dan Angelo is the interviewer. KUCR is based out of UC Riverside, and reaches about 20% of Southern California.